Harmony Day is fast approaching us in Australia. If it isn't already on your school calendar then now is the time to add it. Harmony Day 2016 will be next Monday, 21st March! Haven't done much before? 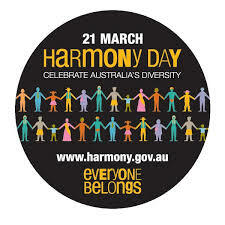 Let's look at what Harmony Day is all about and then some ideas and resources to get your classroom Harmony-ready by next week. Harmony Day is a day to reflect on the diversity of people and cultures that make up Australia's population. According to the official government website it is a day that "everyone belongs". * A girl I was very good friends with in the second grade (she was in third grade so we never actually ended up in the same class again) was from Vietnam. To me, she was my friend, the fact that she looked different and her mum didn't speak English didn't actually strike me as odd. Are you getting my drift? A true multicultural and diversity-inclusive society should be just that - everyone should belong because they are here in Australia. As a child I never really gave another kid's looks or culture a second thought. It could be the way I was raised...I don't know...but what I do know if that there seems to be too much focus on "including those not like me" rather than "let's accept everyone". The difference? The difference is not saying we are inclusive of this and that culture. That should be a given. This in the next generation we are raising and we should be teaching them that all people are the same and equal no matter what. Let's not go drawing lines in the sand to point out differences. To keep this simple I will dot point. I have good reasons for including many of these points - most are dreadful mistakes I have watched colleagues make in schools without realising that they were being counterproductive. * Do not assume! Just because a child was born overseas does not mean they know all about that culture. Do not put them on the spot while you are being a know-all teacher by asking Johnny to talk about his life in Vietnam - he may not remember it (if he was too young when they moved) or may not want to talk about it. * Do not stereotype. This is one thing I have a huge issue with my colleagues over. Most countries no longer have a "traditional costume" so stop portraying to your students that everyone in Japan always wears a kimono or is a samurai descendent, not everyone from a particular country has the same religious beliefs - Italians eat pizza - this is the type of statement that should be avoided. Honestly, it goes hand in hand with not assuming. Do your research about other countries first and make sure your information is up to date. * Do not pick on students. Following on from point one. Allow students to naturally share about their family, beliefs and culture - this means no putting any student on the spot in a way that they may feel intimidated. Use open ended questions for discussion. Make sure you ask a variety of students for responses (so no two children dominate the conversation) - see a tip below for managing that one. If a child wants to share...GREAT! If they don't want to share...LEAVE THEM BE! Discussion hoggers - Yes, we all have those handful of students who love to have an opinion about everything. A quick and easy solution is to limit their contributions allowing others to feel comfortable and have an opportunity to share. The primary advantage to this method is that other students get to talk and the discussion hoggers think a lot more carefully about what they want to say (rather than blurting out the first thing that comes to mind!). I use the same method for all class meetings - so my students are always familiar with it. Go blackline (black and white) - If you have worksheets then choose ones that are blackline allowing the students to be creative. Don't have features on any people faces. Where possible just let your students be creative and draw as much as possible! Here are a collection of resources to consider for Harmony Day this year. 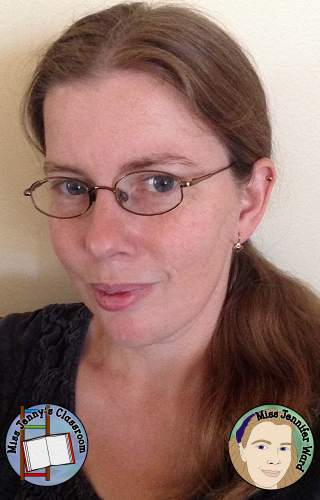 Some are free and others are paid - these are my own recommendations and opinions! * colour and/or blackline posters with harmony written in 36 languages - there are a couple of styles to choose from. Save by buying a bundle. 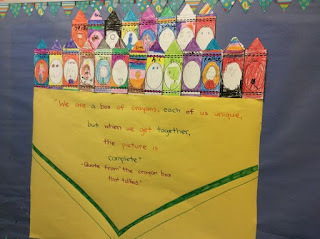 * Have each student colour in their own world in..."A way that shows how you feel about others"
* Writing - just use some lined paper and have students write what "Everyone Belongs" means to them. 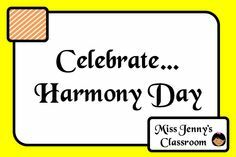 Two sentences minimum for grade 1 - a paragraph at least for older students (and let them be creative with the title "Harmony Day". So keep the work creative with minimum cut and paste. I tried to find the map used - but I think it might just be a teacher-made one. You can either do that or use one of the templates I have made (one focuses with Asia/Africa/Australia and the other on North America/South America - plus the blank circle template. It will also include a blackline of the crayon template for the activity below (because I couldn't find that one either!). This is an idea I found on the internet. It was attributed to a Mrs Brunn and her 1/2 class but I couldn't actually find the page that the search engine took this image from. 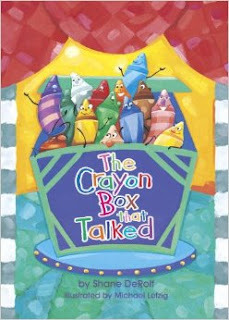 This activity is based on The Crayon Box That Talked by Shane DeRolf. I've personally used that book with students as young as grade 1 (but personally I think grade 2 and up have a far better understanding of the text). Remember the template for the crayon is free in the resource above until Friday, 18th March 2016. 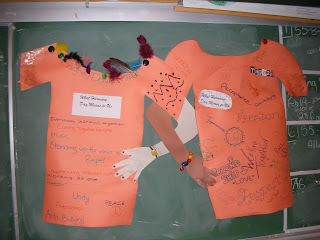 This idea is from the Central Okanagan School District website. Click the image to view and print the lesson plan as well as a range of other ideas you could use with upper primary (grades 5-7) this year. 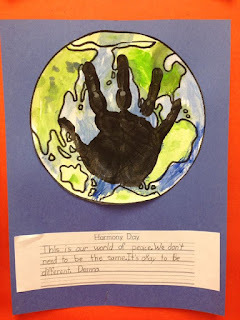 To me this is the perfect way to kick start conversations about Harmony Day and its purpose in a subtle way - I would use this even in younger classes and complete the activity the Thursday/Friday before Harmony Day. Check out more ideas on my Pinterest board.